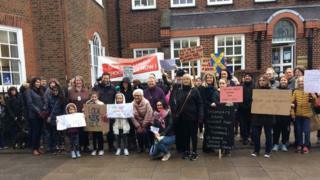 Image caption Parents whose children did not initially get a school place campaigned to "raise awareness of the incompetence of the county council to let this happen"
Hertfordshire County Council has said it needs land to be put forward for educational sites in order to meet future demand for school places. The authority only met demand for secondary school places for September after two St Albans schools agreed to increase their intake. One affected parent said this was "not a long-term solution". The county council said it was working with the district council on its local plan to identify new sites. Hertfordshire County Council said a "bulge year" for births in 2007-8 meant it had 460 more applications this year than last year and was unable to offer a place to 189 children in the first round of allocations. After the second round of allocations, duplicate places resulting from a need for a separate application process for the new Katherine Warington School (being built in Harpenden), were removed and all children without a place were allocated one but in addition, Samuel Ryder Academy agreed to admit an extra 25 children and Townsend School agreed to an over-allocation. Terry Douris, Conservative cabinet member for education, said the authority was "aware of the need for school places in the future" and was "already planning". "We are working closely with St Albans City and District Council on its local plan to ensure they identify new sites to provide schools where they are needed to meet the expected growth," he said. "The county council has created over 14,200 additional permanent and temporary primary and secondary school places since 2012 but we are reliant on the land coming forward for educational sites to enable us to meet expected future demand." St Albans District councillor, Conservative Mary Maynard, who is responsible for planning, said her council was looking at the issue and its Infrastructure Delivery Plan "already contains provision for 14 new primary schools and three new secondary ones". "It is a fluid document that will constantly be assessed and updated in the years to come as it becomes clearer exactly what is needed," she said.